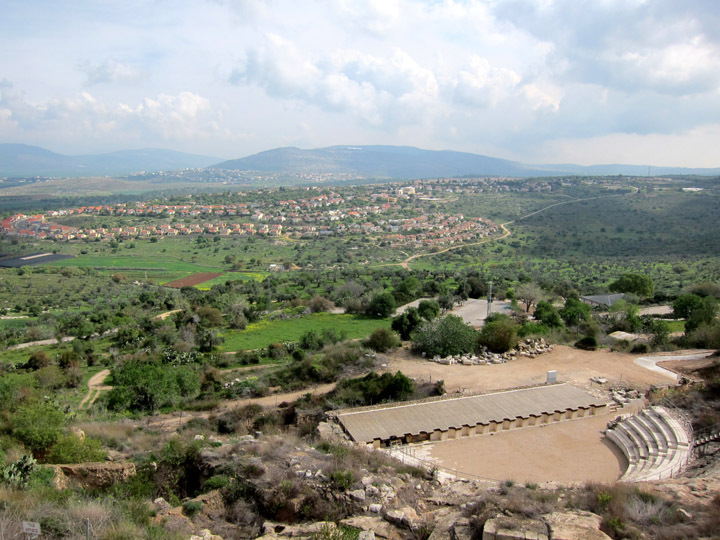 Given its strategic position on top of a mountain, there had been a settlement at Sepphoris for centuries before the invading Romans made it there provincial capital for Western Galilee in 47 BCE. 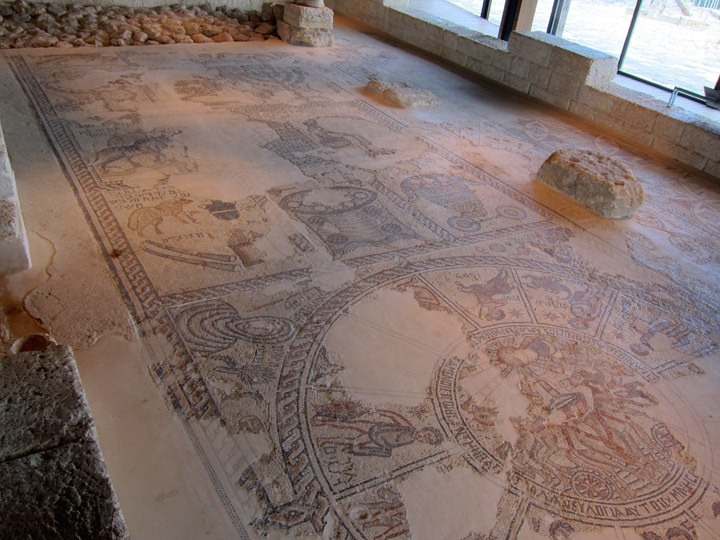 Following Herod’s death in 4 BCE, the local Jewish community revolted and seized Sepphoris which was subsequently destroyed as the Roman army retook the city. Herod’s son Antipas made Sepphoris his capital and rebuilt the city in an extravagant Roman style much of which remains today. The remains of domestic dwellings dating from the first century BCE to the first century CE. Sepphoris largely avoided Rome’s wrath following the Jewish revolt of 66 CE and existed as an important center of Jewish life for centuries. Following a destructive earthquake in 363 CE, the city was reconstructed in a Byzantine style. A Crusader era fortress was build on the mountain summit in the 12th century but was lost to Saladin. 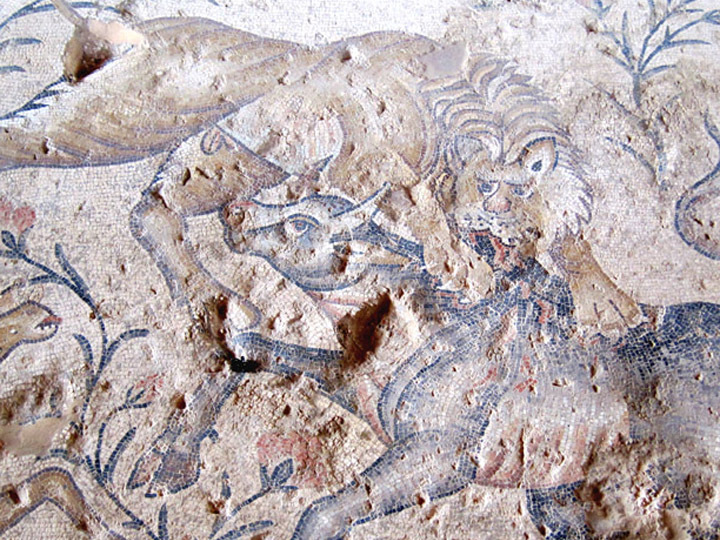 For centuries afterward, ancient Sepphoris slept under an Arab village until the first archaeological exploration of 1931 led to major excavations in the 1980’s. Antipas triggered a major building boom at the beginning of the first century which would have require massive amounts of man-power and money. The poor Jewish town of Nazareth was only a few kilometers away and would have supplied most of the unskilled workers and craftsmen for this extensive construction project. Scholars point out that this would certainly have included “carpenters” from Nazareth and that this exposure to cosmopolitan Roman life may have influenced Jesus’ later ministry. 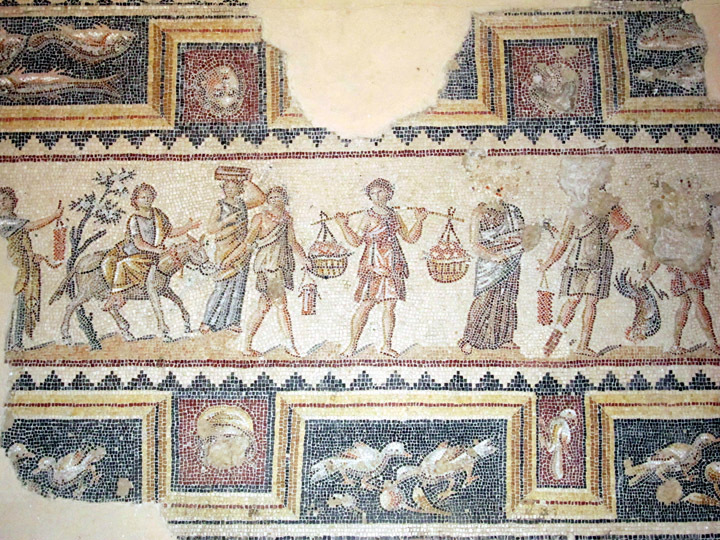 Perhaps Jesus’ theology of social justice and caring for the poor may have evolved from seeing first hand the splendor and excess of Sepphoris. Additionally, following the destruction of the Second Temple, the Jewish faith began transitioning to a rabbinical tradition. The Talmud describes Sepphoris in the 1st and 2nd century CE as an important city of “18 synagogues” and home to several famous rabbis. 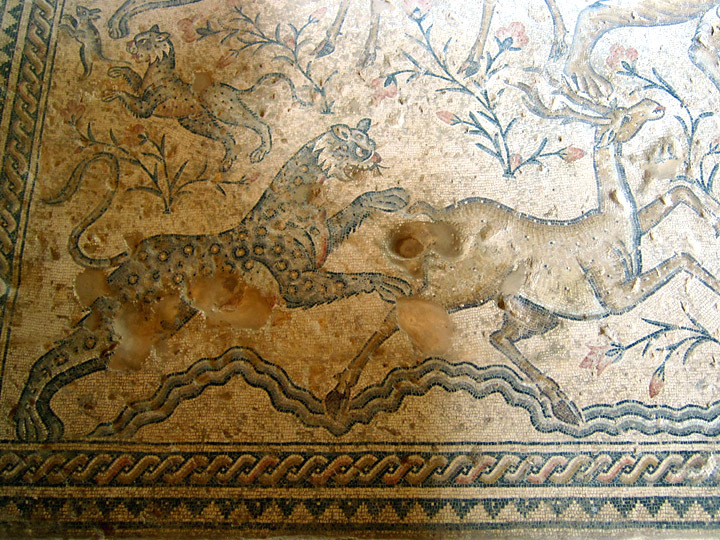 The artistic highlight of Sepphoris is the elaborate floor of an elegant Roman villa, known as the Dionysus House. 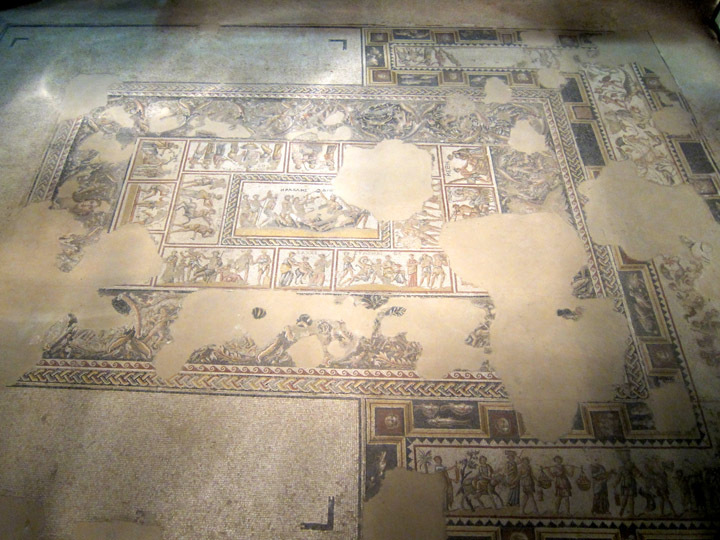 Used as a space for entertaining, the floor depicts scenes from the life of Bacchus and images of his followers feasting. The large blank space on the left of the floor would have been for large couches for the guests and hence were not decorated. 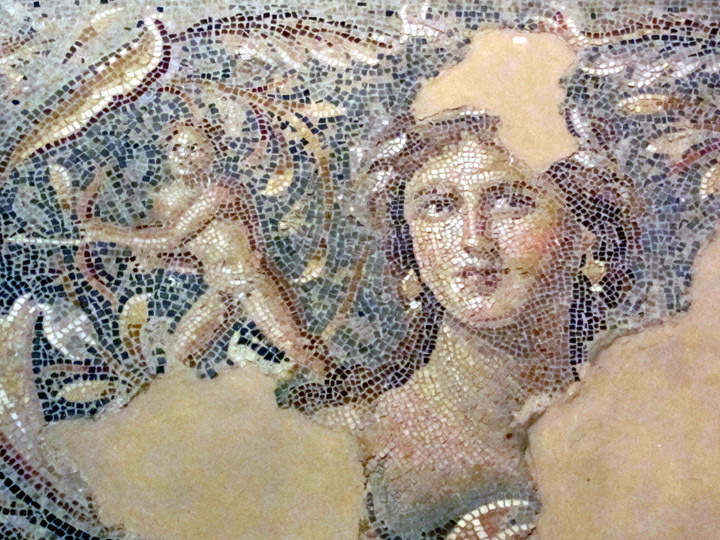 Gods and goddesses, mythical creatures and revelers like celebrate the cult of Bacchus. I especially like the image of men smashing grapes by foot to make wine. On the right, a drunk reveler gets some help. 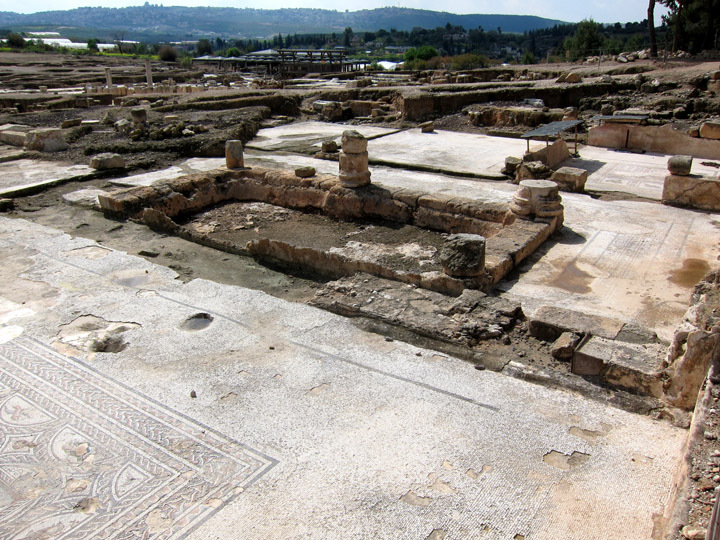 Just off the main street in what would have been the center of ancient Sepphoris is a multi-roomed dwelling with especially creative mosaic floors known as the Nile House. 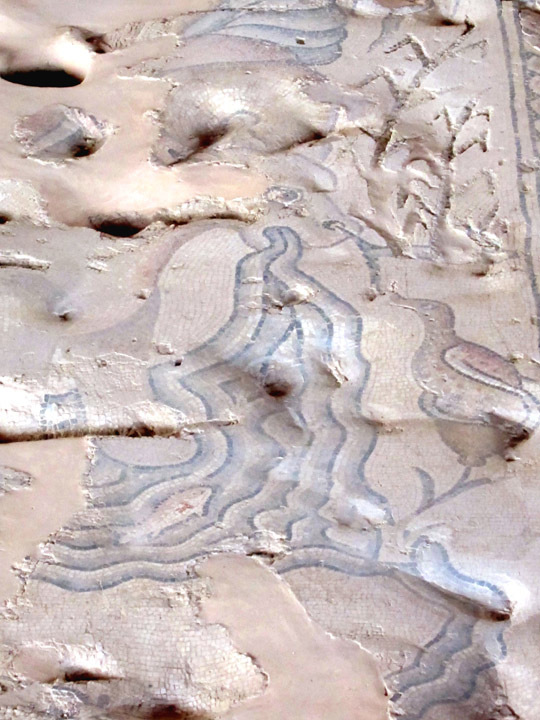 The central rooms of this complex has a elaborate river scene mosaic that is teaming with life. The image shows the annual flooding of the Nile River overseen by the River God himself and a fertility goddess. The banks are crowded with fishermen, fowl, wild beasts and flowers. The entire floor is alive with activity! Leopard pouncing on a deer. Unfortunately this mosaic still needs to be restored. 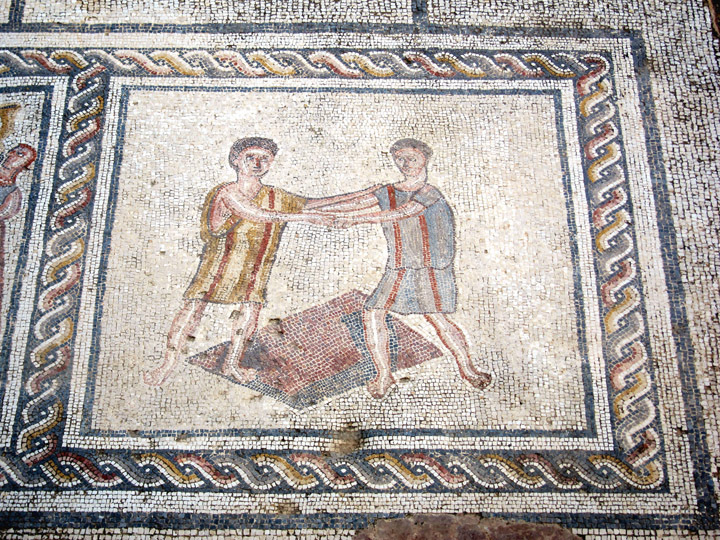 The floor is uneven and there are sunken or missing pockets which cast shadows and make it a little harder to appreciate the beauty of the mosaics in photographs. Interestingly, the source of the Nile appears to be coming from the mouth of a very big animal. Given its face and elephant-like feet, my guess is that it is a hippo. The “source of the Nile” from the mosaic. In the surrounding hallways and smaller chambers are images of Amazons, warriors and centaurs, or elaborate geometric patterns. Portrait of a rearing centaur. 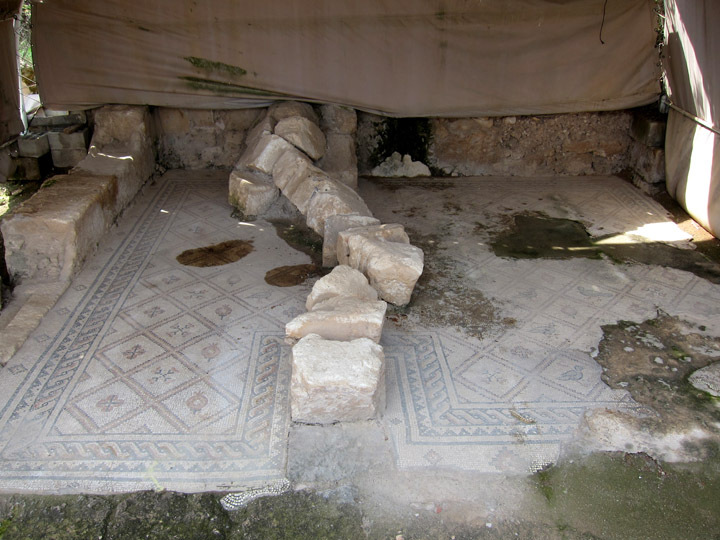 Excavations have uncovered only one synagogue in Sepphoris which dates to the fifth century CE. Demonstrating an impressive mixing of cultures, the central aisle is decorated with Jewish and secular images. About half of the floor is taken up by a huge zodiac disk. 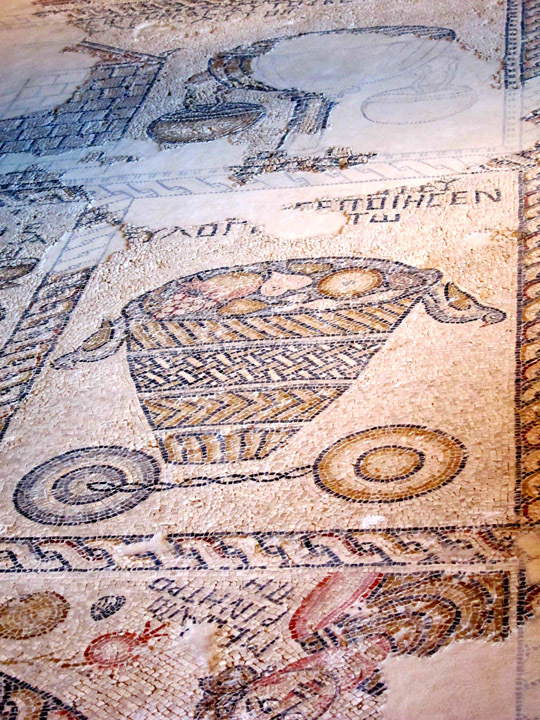 In the center, a radiating sun is pulled in a chariot by 4 horses. Each wedge of the disc depicts a sign of the zodiac with Aramaic captions. The outer four corners around the disc (known as spandrels) depict the seasons personified as young women. For example, winter is bundled up in robes while Spring has flowers in her hair. This depiction of the zodiac reminds me of other pagan Greek and Christian Byzantine examples and shows a high degree of cultural sharing at the time. 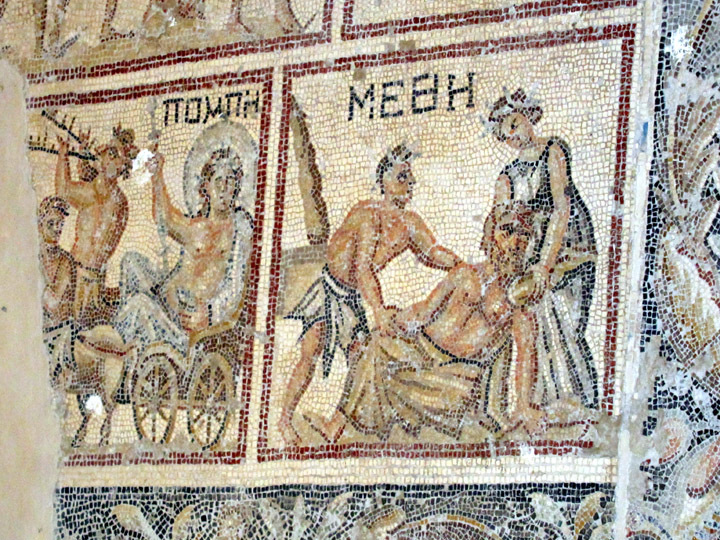 Another section of the mosaic describes temple life. 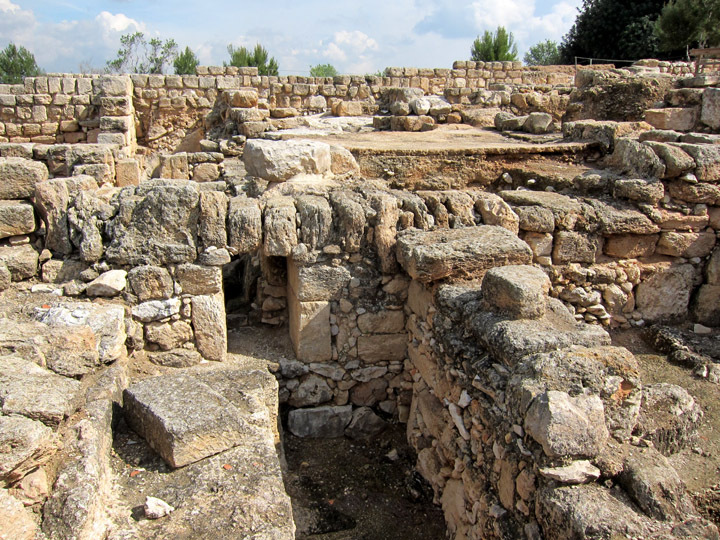 While by the 5th century Jewish religious practices had shifted more toward rabbinical teaching and study of the holy books, the community in Sepphoris still kept alive the memory of Temple worship in Jerusalem. There are images of offerings, incense, a menorah, and the Ark of the covenant. Here we see a basket of first fruits as temple offerings and cymbals. Above is a ritual fountain for purification. 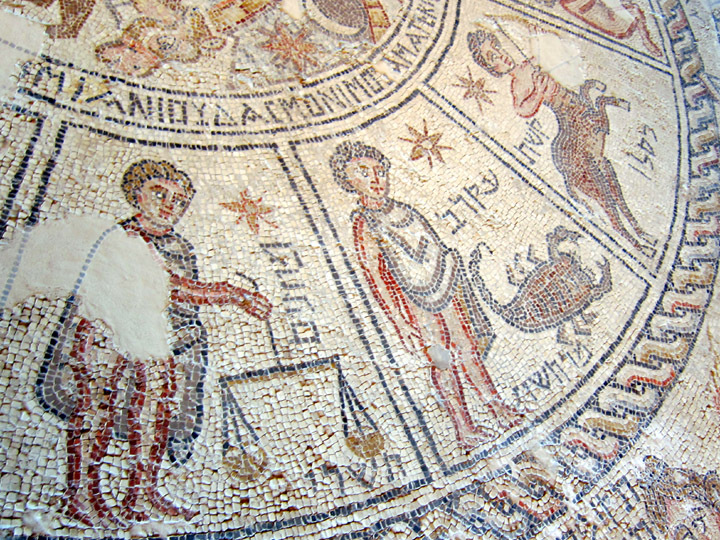 Below is a portion of Spring personified from the zodiac section. While I’ve high-lighted the main buildings, there are lots of smaller houses with their own interesting mosaic floors throughout Sepphoris. Since the site is largely open air, you can wander the ancient streets and peer into people’s decorated homes. I particularly like the so called “Orpheus House” which is named after a lovely central panel of this Greek poet who has charmed a dozen of exotic birds. Surrounding him are scenes of daily life. While Orpheus was completed with great care and detail, the other images are simple and cartoon-like, but definitely endearing! I particularly like the hospitality scenes. Below a visitor is being welcomed into a home. In a nearby panel, they are having a meal and then later playing a game. 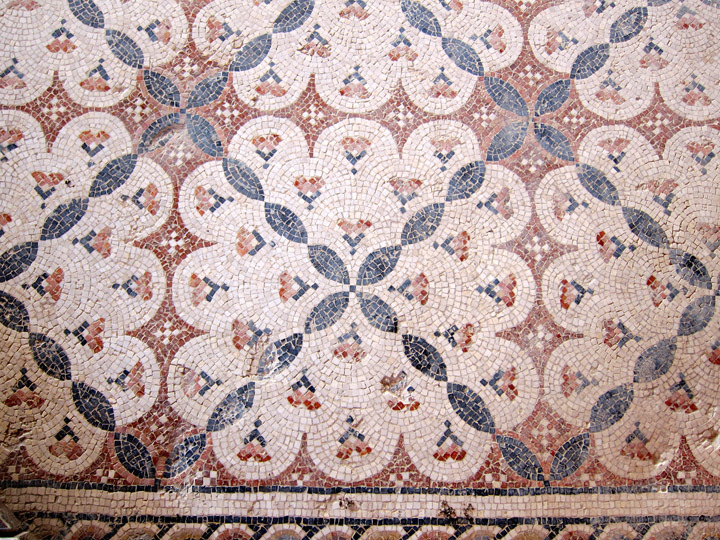 Some houses have mosaic floors with elaborate geometric patterns while others incorporate flowers, birds, or fruits. A small house undergoing cleaning. A toppled wall separates two rooms with geometric mosaics decorated with flowers, pomegranates and birds. 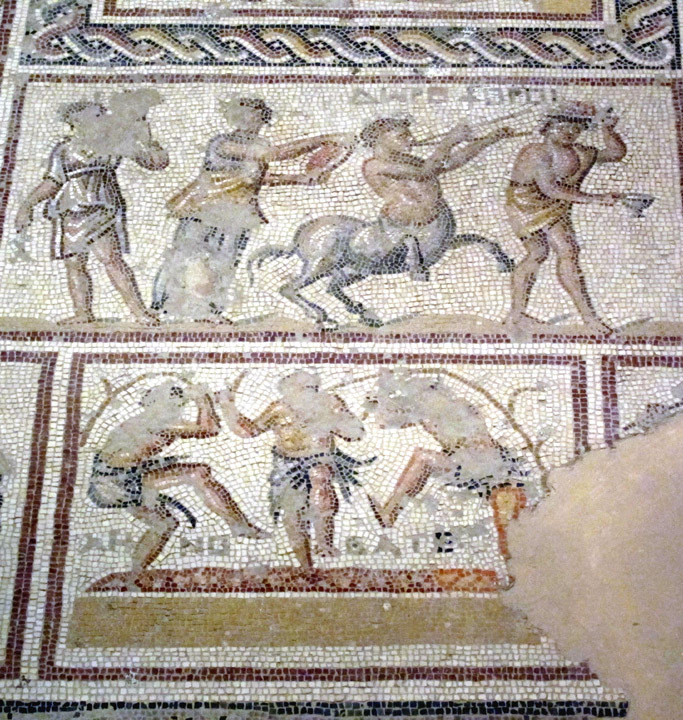 If you love mosaics, you really should visit Sepphoris. The archaeological site is known as Zippori National Park and is administered by the Israeli Nature and Parks Authority. You can find more information here on visiting hours. 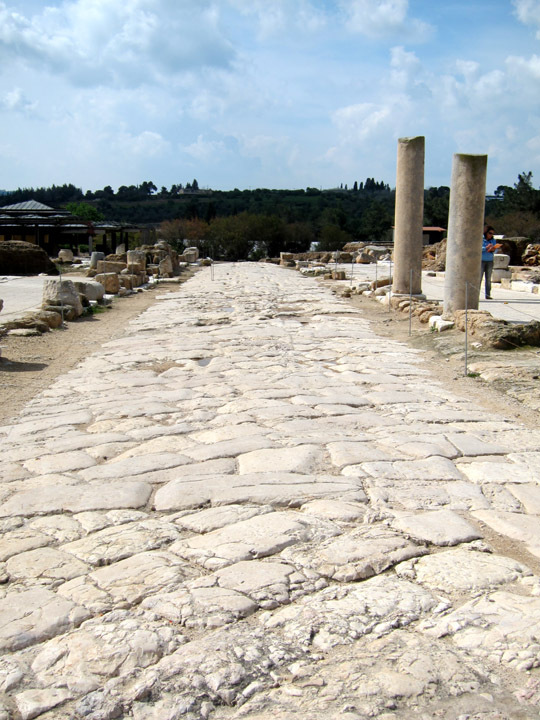 Given how easy it is to rent a car and drive in Israel, I would recommend driving to Sepphoris, but you could take a cab from Nazareth as long as you arranged transportation back as well since the area is pretty rural and isolated. What a fascinating journey into the past! I can’t believe all of these mosaics are open to the elements. While it provides convenient access, it does expose them to weathering. I really enjoyed this post and all of the pics!! Glorious job my friend! Thanks so much Jeff! The Roman Villa and Synagogue are actually in climate controlled protective buildings but remain in situ. The Nile River House is covered but open to the environment and then everything else in Sephhoris is largely uncovered. To me, this demonstrates how rapidly the site has been uncovered and how amazing the finds were! 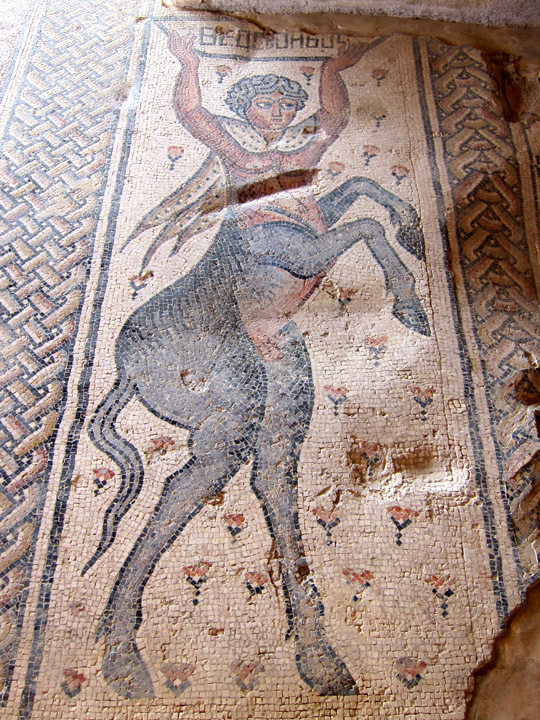 I love ancient mosaics too. They are charming, mysterious, wonderful.